Enter city during daytime despite ban, park vehicles at will. 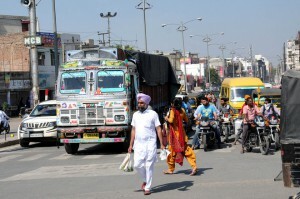 Despite a ban by the administration, trucks are entering the city during the day, adding to the traffic chaos. The authorities had banned the entry of the trucks in the city from 8 am to 8 pm. Despite the claims tightening the noose around those who violate the traffic norms, traffic violations continue with impunity. The parking of the trucks on the main road and near the sports stadium has been banned by the administration. Still, the parking of trucks is going on unabated in the city. Long queues of vehicles can be witnessed on busy roads. District Transport Officer (DTO) Latif Ahmed said the entry of trucks was banned during the daytime but they allowed the local trucks to enter the city. Baljit Singh,in-charge, traffic police, said to check the rise in the number of accidents involving heavy vehicles, movement of trucks was restricted. “The haphazard movement of heavy vehicles put the lives of commuters in danger. Besides, it also hampers the movement of traffic. We fine those who violate the traffic rules,” Baljit added. “Besides chaos, accidents near main chowks have made the life of residents unsafe. The authorities seem to be least bothered about the problem. Congestion and the poor management of parking spaces is rampant in the city,” Sanjay Kumar, a city resident said. “Though congestion on city roads often leads to many accidents, nobody is paying any heed to the problem,” Gurdev Singh, another resident said. “The truck drivers do not mind the speed. They use loud horns that frighten residents. Most of the accident take place due to rash driving,” Kashish Gupta, a city resident said.